This is only a short introduction to the Unreal Editor user interface. If you want to learn something about some specific feature, either find out specific how-to (if it exists) or check out UnrealEd Reference. Maybe the most important thing in this article is to get familiar with names of various parts of the UI. Menubar — just as any other Windows application, UnrealEd has its menubar with various menus related to various features. Toolbar — provides you with the most important features bound to specific buttons. Toolbox — toolbox offers you set of tools split into more sections with various scope. Viewports — area dominating the UnrealEd contains viewports. They are your ultimate way how to see your level and you'll work with them a lot. 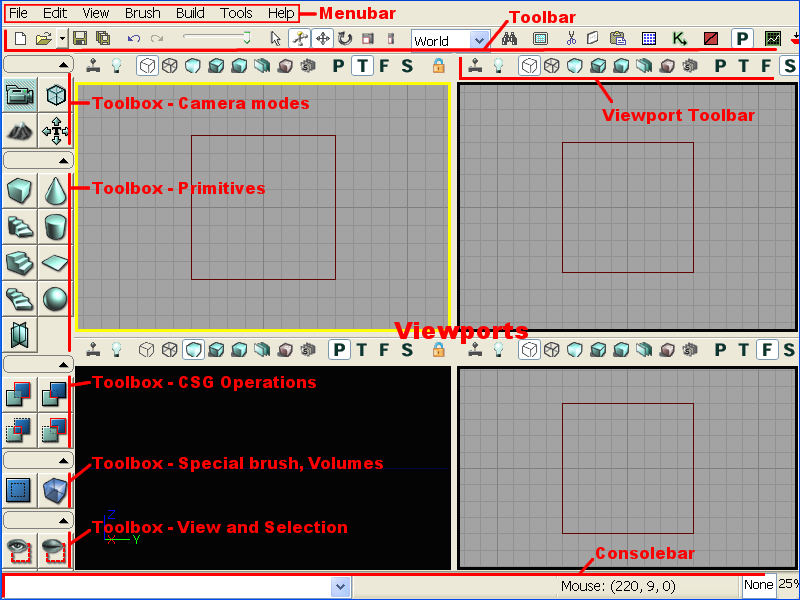 Viewport Toolbar — like the main toolbar — but this one offers functions related to viewport. Console bar — or the status bar. You can enter UnrealEd commands here, check the extend of current transformation, see what is selected of check your snapping. You can't see all this on the picture, but you can consult UnrealEd Reference for the rest of it.